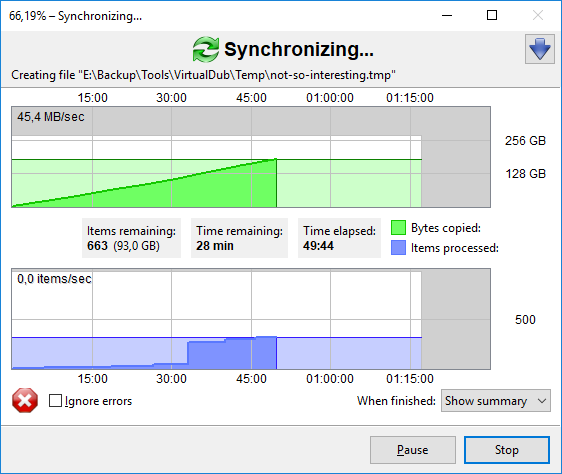 File syncing tool for Windows, Linux or Mac that analyzes folder data, separates frequently used files and creates their backup copies. 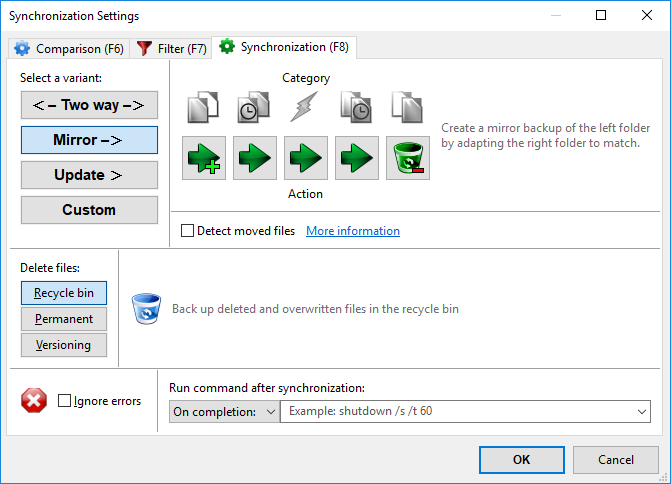 Overall: For those who do not know what FreeFileSync can do for you, let me sum it up for you: it's a program that allows the user to manages folder synchronization jobs. RAID configurations and cloud storage solutions have their place, but they cannot solve many of the problems that this program can. - How do you make external hard drive backups efficiently? The external hard drive naturally exists outside of a RAID configuration and a cloud storage sync folder and it could be very difficult and time-consuming to do the backup manually. - Suppose that you regularly receive a data dump via an FTP. How do you efficiently determine which files are new compared to the last data dump that you kept? You could manually compare file times between your files and the files of the new data dump, but you can lose a lot of time doing so. - How do you synchronize folders of two or more cloud storage solutions in real time? I don't know of any cloud storage giving you that option and a RAID configuration is possible, I suppose, if you give each cloud storage a partition (i.e. Partition_1 for OneDrive and Partition_2 for Dropbox). The problem with the RAID configuration is that it would make your computer environment a little complicated and you won't have the option of synchronizing select folders. I use FreeFileSync to solve all the problems mentioned above. I've had a great experience with this program so far. Pros: We all know it is important to keep multiple backups of our computer systems but for many small businesses, the owner may not know how due to lack of knowledge and/or cost consideration. Ever since I discovered about this software, I am full of praises for it. Being free (donations welcomed), you cannot complain about the price. It supports Windows, Mac and Linux systems so another big plus there for any business. What I like most about it is that it has advanced features which will meet most if not all of the needs of even the most demanding user. You can set it to sync files meeting certain criteria (e.g. only those with .DOC extensions); you can then specify whether to do a mirror sync (one-way) or a full-time sync (two-way); you can set it to perform the task at a preset time or in real-time (though I haven't tried this yet). Now, you really have no excuse not to make a backup of your system! Cons: Being open-source software, there is no dedicated telephone support. And for the novice, setting it up right at the beginning can be intimidating. But trust me, once set up, file sync becomes a breeze and no-brainer. Other than this, I really have no complaints about the software. It is also regularly updated approximately once a month. 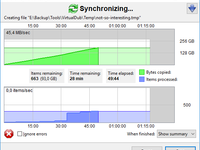 Overall: It automates a lot of mundane effort to keep a perfect backup of my important files. Without it, I would have to open up a file manager with dual windows, and manually inspect files on both sides to determine which files to backup/delete in order to keep a mirror image. FreeFileSync helps me to perform this task in seconds! Now, I am able to keep a mirror image of my important files inside an external hard drive which I keep with me at all times. In the event of an emergency which incapitates my main computer system, I would be able to continue my business using another computer with literally no downtime because I have a perfectly sync mirror image of all my important files. I love free software, and this is one of the better ones! 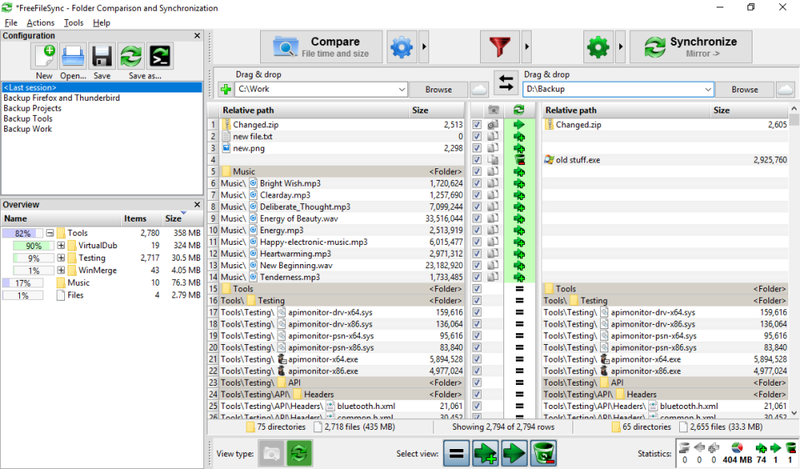 Pros: FreeFileSync is a great app for performing file comparisons & backups. I use it daily to compare all of the company's ever-changing file additions & edits, then mirror them to a mobile backup drive that I move offsite weekly. It is very fast when performing the initial comparison of changed & new files and will display the before presenting the option of synching or mirroring to the new location. It also has a feature to do a constant sync/mirroring but I have yet to utilize that feature. Cons: I have no cons to speak of. It's funny, but because it's open source and free I think it has a bit of a malware reputation but I have never seen any kind of issue with this at all. Overall: It is an absolutely vital part of my backup strategy on a daily & weekly basis. This makes perfect and easy backups; to Dropbox, in my case. Doing it automatically is tricky. Pros: It is extremely easy to set up for manual use. (As in "back up now.") It only copies changed files, which is the secret of the fast backups. You ban back up as large a set of files as you wish. If your office burns to the ground, you still have your data safely tucked away. Cons: The learning curve in general is not bad. Setting up backups as a "task" is more difficult, although there are helps online, here and there. I back up once a day, but, it could be every hour. Pros: I love that FreeFileSync is free to download and use. There is a donation system if you find it useful, which I have donated to. Cons: I would say that it doesn't have access to cloud storage, but recent versions have added this feature. Great! 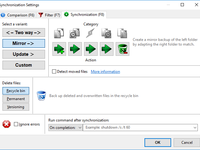 Overall: I use FreeFileSync to back up my files from my desktop computer to a removable drive, to protect against failure of my desktop computer. I have scheduled it to automatically back up every 4 hours, and it has always worked quickly and reliably, and hasn't bloated my computer with junk files. Pros: I like the way the product maintaining synchronization silently, once providing the proper privileges it can go independently while keeping the changes in files and directory updated using minimal CPU and RAM resources. Cons: I leased liked the fact the program gets the red flags from my anti-virus, changing the anti-virus program not necessary will fix the issue. Pros: It allows drag-and-drop interface to facilitate the sync folders along with options to "mirror", "copy" or simply "add the changes". It also allows multiple sync modules to be run at the same time. So all it takes is one time set up and any number of folders can be set up to sync in very specific way. Its ability to integrate into any given batch script is in short, amazing! After the initial set up it allows you to simply copy the batch script, which can be added to any other batch file or even the windows task scheduler to automate the process even further! Cons: Its in-built memory feature only remembers the latest set of sync files. So if you want to run any sync module that was created before that, you will need to navigate to the saved file location or the batch script. Overall: It enables me to automate part of my workflow. Now, I no longer have to keep track of when and what files have been synced to the server. The single click, takes care of it all for me. If you need automatic task of backup, in diferents modes (incremental, mirror, etc), use this! Cons: Really not to many cons: use this in LAN need administrator access, for this reason if no are administrators will get problems to access directories. Pros: I love that FreeFileSync can use my Google Drive storage now, and as I have unlimited space, I have a free solution to back up my files without needing an external hard drive. Cons: Google Drive backup is a little slow, but I believe this is the fault of Google, rather than FreeFileSync, as they provide a very slow API. Overall: I have used FreeFileSync for many years. Before that, I used Robocopy, which was a command line utility. It worked fairly well, but had problems with file permissions. I then started using FreeFileSync, which has a graphical interface, and some friendly options such as mirror and updating. I find it indispensable. I also like how it has cloud features in the form of Google Drive backup. Pros: It is very easy to manage I only need to plug my tablet or smartphone on the computer, start the app and in few minutes my files can be updated and I can continue my work with my ready for another actualization, just like that. Cons: I will not recommend this app for people who works with heavy files, because it can be very difficult to update the files because it takes so much time to do the job. Freefilesync is fast and easy. Pros: Easy to use, great help examples. Has always worked for me. Cons: It was working so fast I wasn't sure if was working properly. Overall: Helped me easily backup/mirror my pictures and videos. Pros: I did not have to worry about the updated of my files and folders because this app do it automatically for me, it works perfect in my USB and External Harddrive the synchronization is perfect, and the most important of all is that is a free software. Another important feature is that this app comes in two version one portable and another for download and do all the task direct in your computer. For me works perfect because I only use in personal devices, sincerely I have never tested the app on a server or computer with a huge amount of files, but for me works wonderfully. Overall: Amazing app for synchronize files between to elements of information. This program helps me feel safe as I am able to backup my important files and folders with a click! Pros: The software is easy to install, easy to set up, and super easy to use. I love that there are options to mirror folders, or just add, or just delete. There are lots of options that make this backup software exactly what you need it to be. Cons: My computer sometimes like to rename my ports, so if it does that, then I have to do a little more work to make sure that my "pre-set" back up can go where it needs to. Overall: My laptop started to crash. I installed this software and backed up all my important data. I was able to get my new laptop working well quickly because of simplicity and ease of use of this software. Now I rest much easier as I keep all my important work backed up frequently, and quickly. Pros: This is the first app that I use that do this and I love it, because it is very light it works wonderful on the computers or having my files in my USB, it does not have any problem with the amount of data of information that you want to synchronize, and the most important of all it is free and come with and excellent user manual. Cons: It computers with low RAM memory the process can be very slow, because the app consume a big part of the resources of your machine, and its is recommend that you use this app in only one computer for keep secure your information. Overall: An excellent app for synchronized your files. Pros: It works fast, very easy to manage, it can be use in computers or USB devices, you can syncronized huge amounts of data or only a small set of files, it can be install in how many computers you need and the process of syncronization works perfectly. Cons: Any complain about this app, I had try a lot and finally get this one, that works perfect in the computer and also my external hard disk and flash drive. Overall: Excellent tool to syncronized data. Pros: Extremely easy to use, multi platform so that someone who uses multiple OS'es can use the same tool across all of them. Cons: Its hard to find something wrong with a great product that is as universal and easy to use as this one. Pros: FreeFileSync is as basic as syncing files can get. Setup is easy and fast. It is available in most commonly used operating systems. File backup is an additional feature of FreeFileSync. Another advantage of it is the fact that it's free yet it offers a lot. 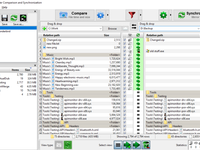 FreeFileSync is one of the best file syncing software. Cons: For a cheap price, everything works as it should be. There are no major complaints on my end. Pros: The process is easy and fast, I only have to plug in the computer my usb or external hard drive and the files will be automatically synchronized and ready for use when you want, this is big help when you work with accounting data. Cons: When you manage many files or very large information it can be a very slow process and it takes a lot of your time to copy and synchronized the files on the devices and viceversa. Pros: Love how it shows you if there are duplicate files that may be copied over. Its easy to just clip a button to copy all the new files. Super slick. Cons: It would be nice if it had a few more automated options to backup on it's own. Pros: What a great program. Very easy to use and configure. It has made backing up my laptop so eay to do. I recommend donation for the upgraded version. Cons: As normal the estimated time of file transfer changes. With the different ways of backing up things it can be overwhelming on which method to chose. Overall: We are able to get quick and easy backups on our computers. Pros: It is very easy to use, I only have to plug in my smartphone or tablet in the computer and automatically the software start updating the files, everything fast and the process is very easy. Cons: If you try to synchronized heavy files the software runs very slow, and I recommend not to use if your work with be amount of data. Pros: This app bring me the easiest way to transfer the data from my devices to the computer and vice versa, everything is very easy, you only need to plug your device in the computer and immediately the data is updated for you. Excellent product, saves so much time! Pros: I love the ability to backup only files that have changed. You can update or mirror one way (either from or to) or mirror two ways (sync both from and to). I used to spend 4 hours every weekend backing up my documents, now it takes less than 10 minutes. Pros: It is very easy to use. It is running perfectly and it doesn't have any problem with amount of files you want to synchronize. Cons: I don't have any complains about this software except sometimes is a little bit slower with some larger files. Overall: Perfect for computers that are usually off-line for business or security reasons.